When World War One ended, the Moortgat’s family brewery produced Victory Ale as a way of celebration, a beer that eventually morphed into Duvel in the 1960s. Katrien Bruyland tells the tale of this gorgeous golden ale and reveals a surprising Caledonian connection. Saint Arnold is the patron saint of Belgian brewers, while Gambrinus a legendary beer-loving king. 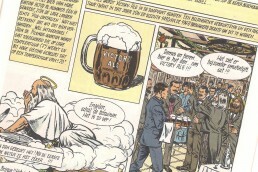 In Duvel Moortgat’s 1984 comic strip story about the origins of Duvel, the heavens’ lack of tasty beer causes an angelic uproar. It follows paradise’s two biggest beer experts back to earth. Their mission? To find a beer to stop the angels’ mutiny. The official Duvel story on the company’s website doesn’t stray far from the romantic comic strip line depicting the family’s story in beer. In his quest to tailor a beer after the First World War, based on the popular ales of Belgian’s British allies, Albert is said to have embarked on an epic journey across the North Sea. In Edinburgh, Younger’s Brewery was said to having shared their yeast with the Belgian visitor, while the story claims Albert returned with the yeast in an aluminium milk jar. At less than 30 kilometres from Breendonk, John Martin already imported British beer in 1908. Ten years before the First World War, Younger’s beer was available in Belgium. The strong ale being live beer, it makes no sense that a technically skilled, perfectionist brewer would choose a time-consuming journey to harvest yeast in Edinburgh instead of cultivating yeast from a bottle of imported ale. However, Moortgat worked with Professor P Biourge, a world-renowned yeast expert, who is said to have combined several strains from the Edinburgh yeast to be used in Victory Ale. Albert was trained by the best. A skilled perfectionist with a penchant for cleanliness, nothing escaped his scrutiny. 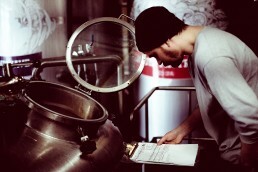 ‘He kept the brewery impeccable’, says Veerle Baert-Moortgat. His focus on hygiene would later land him a contract to bottle Tuborg. Surfing on the popularity of Danish luxury pils, Albert’s brother Victor sent Duvel samples to each pub that ordered Tuborg. Duvel boomed. 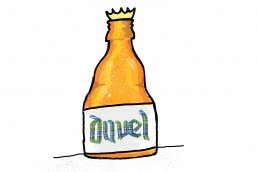 From dark and strong, Victory Ale became the pale blond and equally strong Duvel in the 1960s. The transition is mainly credited to Albert’s collaboration with Jean De Clerck, a professor of the University of Louvain brewing school. Meanwhile, the true story of Duvel is told by its yeast. The truth is still there for everyone to smell. The key? 4VG or 4-vinylguaiacol. While considered a phenolic off-flavour in bottom fermented beer, 4VG is well-known to aficionados of top-fermented Belgian style golden ales. Duvel has a subtle 4VG character. Leffe, being the quintessential example of 4VG beers, offers strong hints of clove or ‘sausage-type meat’ aromas. Chris Bauweraerts is co-founder of Brasserie D’Achouffe, which Duvel Moortgat purchased in 2006. He suggests discerning noses will still be able to detect Belgian beer descendants of the original Younger’s yeast that, somehow, found its way from Edinburgh to Belgium. 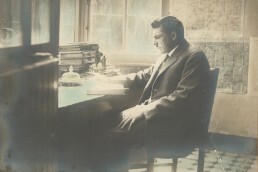 Raymond Moureau, who worked at Brasserie Grade, told Bauweraerts that Jules Grade – as Albert Moortgat years before him — went to visit William Younger’s in Edinburgh. He came back with yeast. Brasserie Grade both brewed Vieux-Temps and Leffe. Are Duvel and Leffe unsuspecting cousins? Both being of British ale blood, they most definitely are. 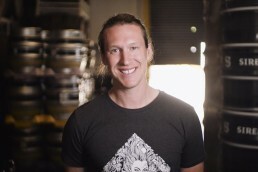 Siren Craft Brew, one of Ratebeer’s Top 100 Breweries in the World, has launched their first crowdfunding campaign through Crowdcube.com. The brewery, which picked up CAMRA’s Supreme Champion Beer of Britain award this year, is raising a minimum of £750,000 which will go towards a new canning line, increased capacity and lab & efficiency improvements. The brewery has also said if it reaches £1.5m in overfunding it will fastrack plans to open two city centre bars. People will be investing for equity in the business, along with some ‘rewards’ including discounts, exclusive events, brewery tours and more. Where did you brew before and what brought you to the UK? I brewed at Double Mountain Brewery in Hood River, OR and before that at Full Sail Brewing also in Hood River. Well, Siren brought me to the UK really. I was looking to brew for an innovative and exciting brewery, preferably outside the states, and well Siren ticked those boxes. I hadn’t previously heard of Siren but they got a great recommendation from a colleague in the UK so I sent a resume and as luck would have it they were in the market for a head brewer. What do you do if not brewing, fishing, racing fast cars, eating? I hang out with my three kiddos and wife they are my best friends really. We like to travel quite a bit so currently I’m enjoying exploring the English country side. I also love making bread and mountain biking. Two things I try to do as much as possible but maybe not as much as I’d like. How do you design a beer? 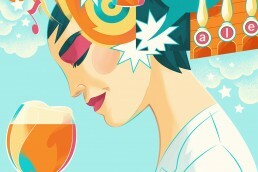 I generally design a beer by starting with what I envision the end product turning out like and then working backwards. I’ll write out a description of the beer first and then figure out what raw materials and techniques will get me what I’m looking for. After that I cross my fingers that everything turns out good. No not for me. I love the country side and traditional country pubs. The only thing missing is a good craft beer pub… luckily we are going to be opening a tasting room and event space at our new warehouse/barrel home so it won’t be long until Finchampstead gets even better. In our love of hops we forget about water, are you a water bore? Is that a small animal that? If so then yes! You have barrels for wood aging, do you see a day when breweries ditch wooden barrels in a similar way as the great porter breweries did, or is this wowing of wood just a settling back into the past? This is a lightly smoked barley wine, potent and muscular, complex and quite content to be sipped as the sun goes down. A winter beer yes but also ideal for drinking in the spring to remind yourself that winter has thankfully just passed. Light amber in colour, pulsating with a Bakewell tart aroma and a secondary note of Isley-like iodine smokiness, the carbonation is gentle, the mouth creamy, with a variety of toffees, chocolates, fudge and dark candied fruit being handed around by a much loved great aunt. There’s a power and intensity about the beer, a heft and a weight, yet it’s easy going in the way it delivers. 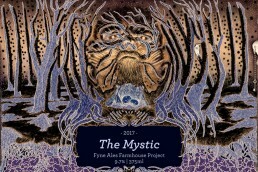 A masterpiece of a beer and definitely one to age to see how the mystery of beer changes through time.